Get support for your project from a community of innovators and entrepreneurs of TU and WU. Present either your start-up or your first idea in a relaxed setting and without pressure. At Joint Forces you have the opportunity to attract the attention of interested co-founders, employees and mentors. The feedback from the community can provide the decisive impulse for the next step. 3 START-UPS – Already founded start-ups, which have provided their proof-of-concept, are pitching and looking for employees, valuable contacts or investors. 3 PROJECTS – Without guidelines or specifications, future founders are presenting their project ideas to get some feedback and perhaps even get to know future co-founders. 3 SHOUT-OUTS – Everyone has the chance to make a brief request, an event announcement or whatever. No feedback, no questions – who wants to know more, has to ask for details during the networking afterwards. 22.05.2019 @ WU- NEXT EVENT! Shout-outs and other participants please register on Eventbrite. You have an idea, but your friends are not a big help because no one has any idea of founding a company? Then muster all your courage and walk up on our stage. Present your idea at JointForces and get support and feedback. You are a start-up enthusiast and want to learn about new ideas? You know why most start-ups fail and what could be improved? You are looking for an evening event that has not existed yet? 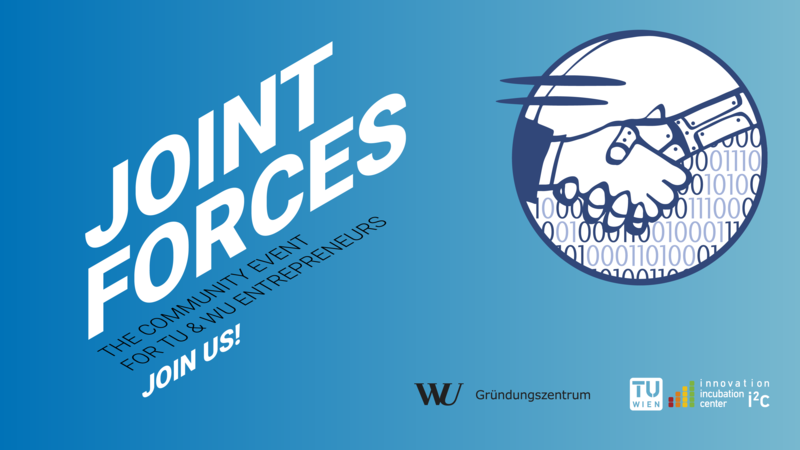 Then come to JointForces and support young start-ups and project ideas. Without registration, without costs, but with drinks and pizza! Joint Forces is a monthly event hosted by the Innovation Incubation Center (i²c) TU Wien and the WU Gründungszentrum. Please note: During today’s event photos and/or videos will be taken which may be published in various media for reports on the event or general PR.